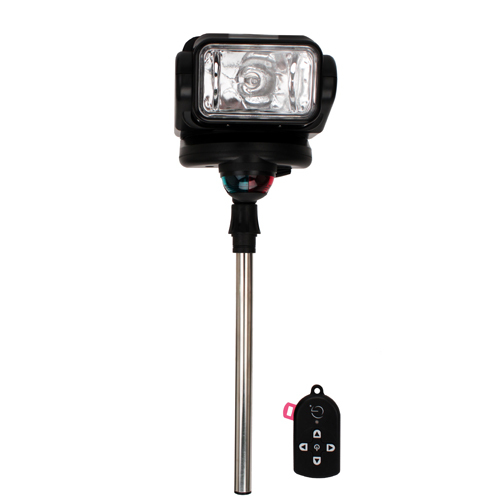 locate hazards, shoreline, navigation buoys and unlit boat docks. With its 360� rotation x 90� tilt and the 25 ft.
on the dock. Easily attaches to most existing two or three pin bow navigation light sockets. - 1000 Lumen 55 watt bulb. - 80,000 candela Peak Beam Intensity. - Compact Programmable RF Wireless Remote Control with 16 security settings. - 12' stanchion raises light above the trolling motor. - Integral bi-color navigation light with USCG 1 N.M. rating. - Adaptable to both two and three pin nav-light sockets.